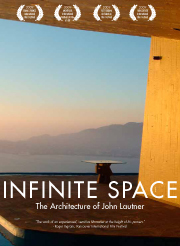 Come see Infinite Space at the Yerba Buena Center for the Arts (San Francisco) on August 15 at 2:00 p.m., part of the Center’s summer festival of films on design and architecture. Get the details. Later, on September 15, the San Francisco AIA will screen the film. It isn’t on their website yet. Keep an eye on the calendar. On July 31 the Society of Architectural Historians, Southern California Chapter, will screen Bette Cohen’s The Spirit in Architecture: John Lautner, and present a panel discussion about the film. The panel will include Cohen, film co-writer Tom Marble, co-producer Evelyn Wendell, architectural historian Alan Hess, and Lautner scholar Jon Yoder. Read about the presentation and the panel members on the SAH-SCC website. Tickets will be free for students, $15 for SAH-SCC members, and $30 for non-members.